This page is a work in progress and a labor of love. If you have questions (or answers!) after reading below, we’d be grateful if you’d pipe up. Let us know what we’re forgetting to include, or if we’ve left you with more questions. And, of course, we’d also love to hear if this glossary is helpful. We wish we’d had access to something like this when we were just starting out and drowning in beekeeping lingo. Thanks, and happy bees! A wetted bee brush can be used for nudging bees out of the way during hive inspections. Actually brushing bees makes them mad and can hurt them. 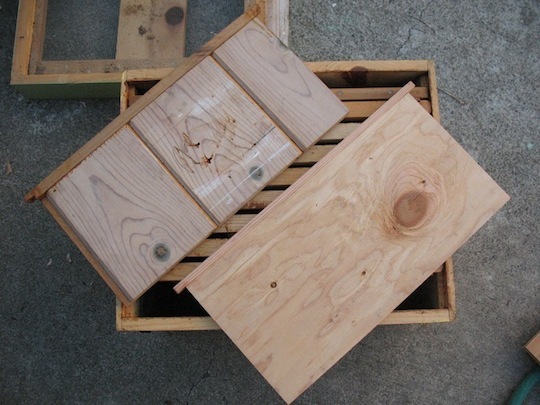 The bottom board in a Langstroth hive sits below the bottom box and serves as the floor of the hive. For hygiene reasons, we only use screened bottom boards (see below). A ‘deep’ refers to a standard sized box used in Langstroth hives that is deeper (top to bottom) than a ‘medium’ or a ‘super’. When beekeepers have their way, deeps are usually boxes where bees rear young (as opposed to supers, in which bees store honey exclusively–again, when beekeepers have their way). The bottom two boxes are deeps, and the top box is a super. 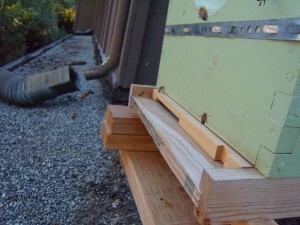 Entrance reducers are used to decrease the size of the opening to the hive. This is most often done when a colony is just getting established, or in fall and winter when populations may be small and bees may be vulnerable to robbing (i.e. bees from other colonies attempting to enter the hive and steal honey). A smaller entrance can make it easier for a colony to guard the front door. Standard entrance reducers are available commercially. Blocks of wood and wads of dry grass are also viable options. 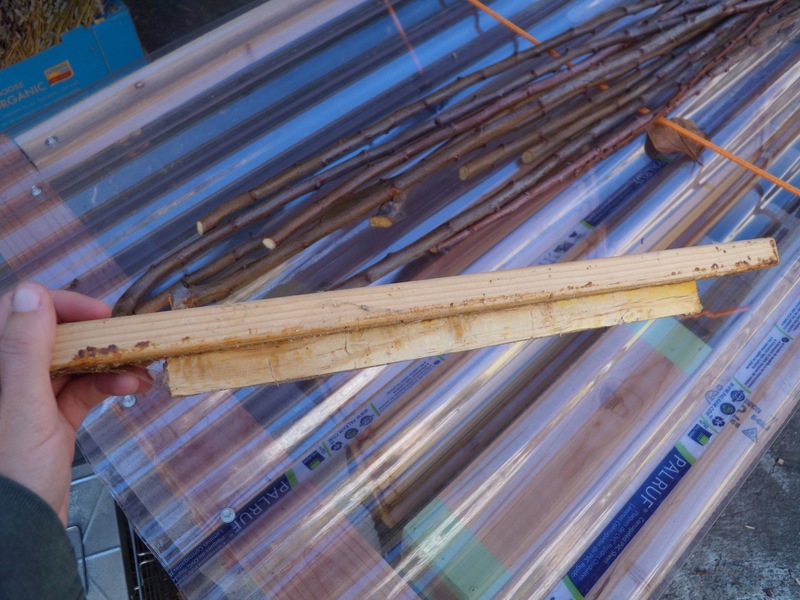 We often carry scraps of wood with us when we go out to inspect hives so that we can choose a customized entrance reducer. A standard entrance reducer with two possible entrance sizes. This hive has a wood block entrance reducer. This is a commercial entrance reducer. The notch in the foreground of the reducer is the other possible entrance size (if the reducer were rotated one turn clockwise). 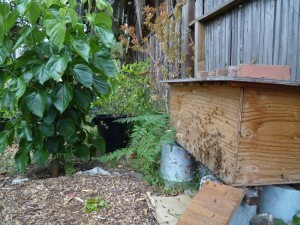 In fall and winter, we often reduce the entrances of our top-bar hives as well. For hives with round holes for entrances, we insert corks or carved wood pegs to close holes that don’t have steady streams of bee traffic. 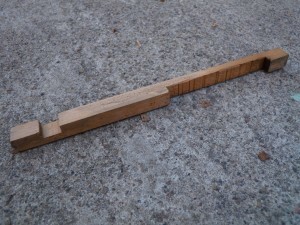 In this picture, the three entrance holes on the left are closed with pegs, while the three on the right are open. 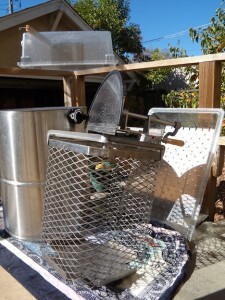 This is a simple honey extraction tool for small-time beekeepers, or anyone keeping top-bar hives. Our extraction bucket is actually two five gallon buckets: the top bucket has holes drilled in the bottom to strain the honey through and holes drilled around the sides with bolts inserted. The bolts keep the bucket from nesting down into the bottom bucket. 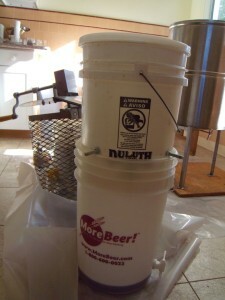 Ideally, the bottom bucket should have a tap, or ‘honey gate,’ for easy bottling. 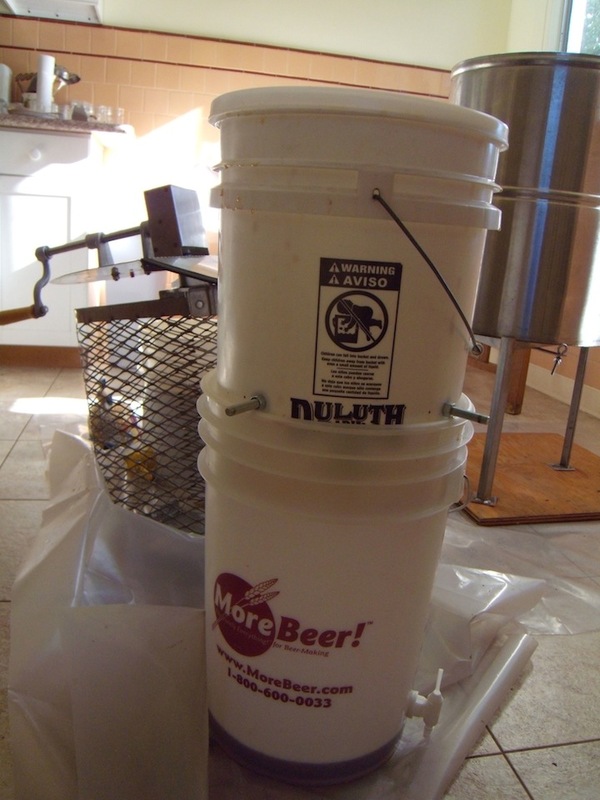 With the buckets stacked, we place honey comb in the top bucket and use a potato masher to crush the wax. We borrow a hand cranked extractor that fits four frames at a time. 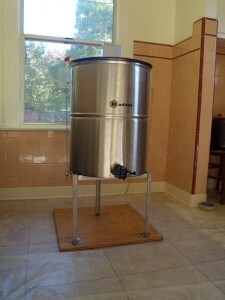 After uncapping frames of honey, you simply place them in the extractor and turn the crank! The crank is hiding around the back in this picture. The extractor disassembled. It is quite the ordeal to clean up! Follower boards can be placed outside the outermost frames in each box. They create several inches of dead air space between the frames and the sides of the box in a Langstroth hive. This extra room doesn’t cause problems with ‘bee space’, and bees will not build comb between the follower boards and the edge of the hive. 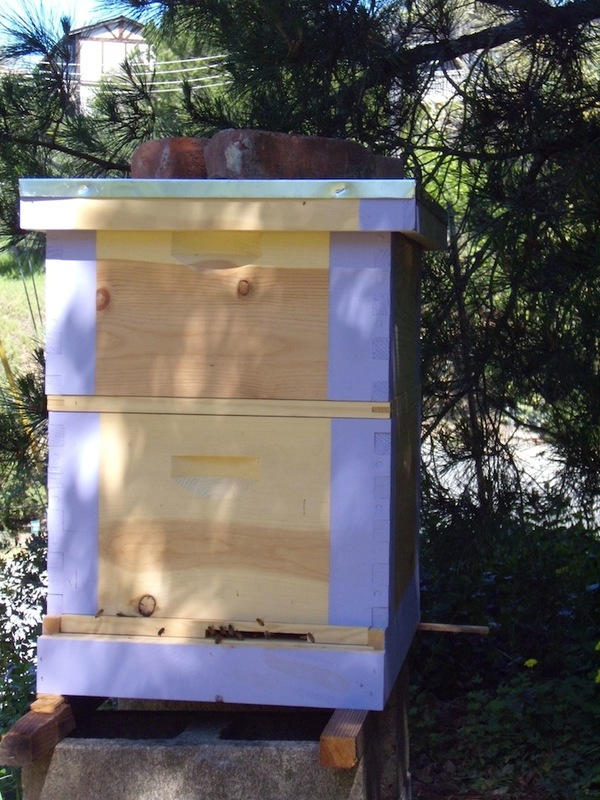 The extra air space allows for increased ventilation within the hive and increased temperature insulation. 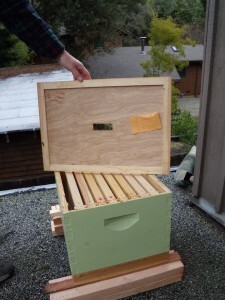 In addition, follower boards make it very easy to manipulate frames during hive inspections–once the beekeeper removes the boards, there is plenty of ‘wiggle room’ to move frames around and get a good grip on any frames you want to lift out of the hive. Homemade follower board, top; store-bought follower board, bottom. A standard 10-frame Lang box, with 8 frames sandwiched by follower boards. Foundation is the sheet of wax or plastic that fits into an empty frame. Bees then ‘draw’ comb out from the foundation. 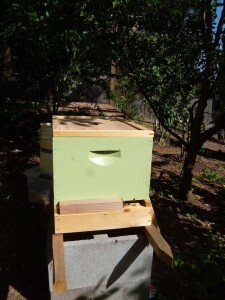 foundation ensures that the bees draw the comb where the beekeeper wants them to. wax foundation generally has some wires running through it. 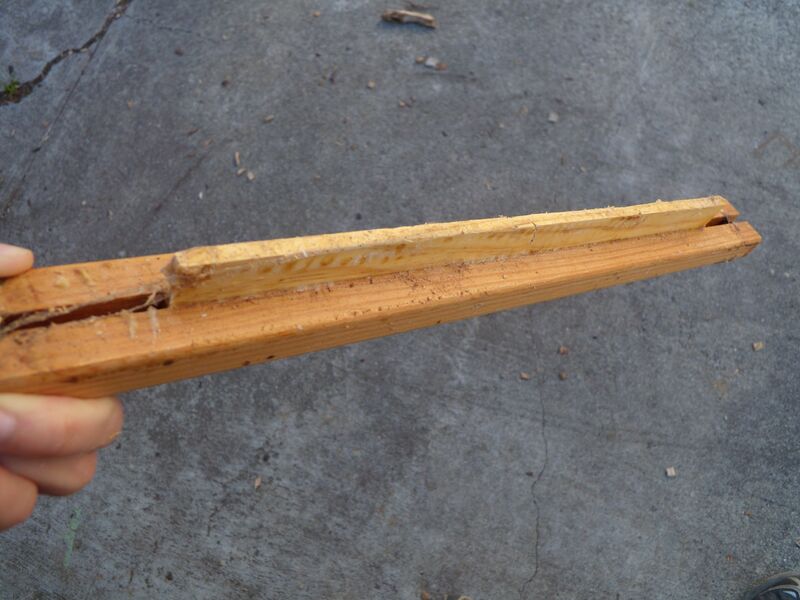 this provides additional structural support, making it less likely that the wax will warp or tear when the beekeeper extracts honey from the frame. The bees have not yet ‘drawn’ comb on this all wax foundation. You can see the wires running through the wax and the metal pegs at the edges (these provide further support and hold the foundation straight long enough for the bees to get the right idea). Some beekeepers prefer not to use foundation in their frames and to let the bees draw all of their own comb. In this case, they usually provide some type of guide at the top of the wood frame to get the bees started in the right direction. 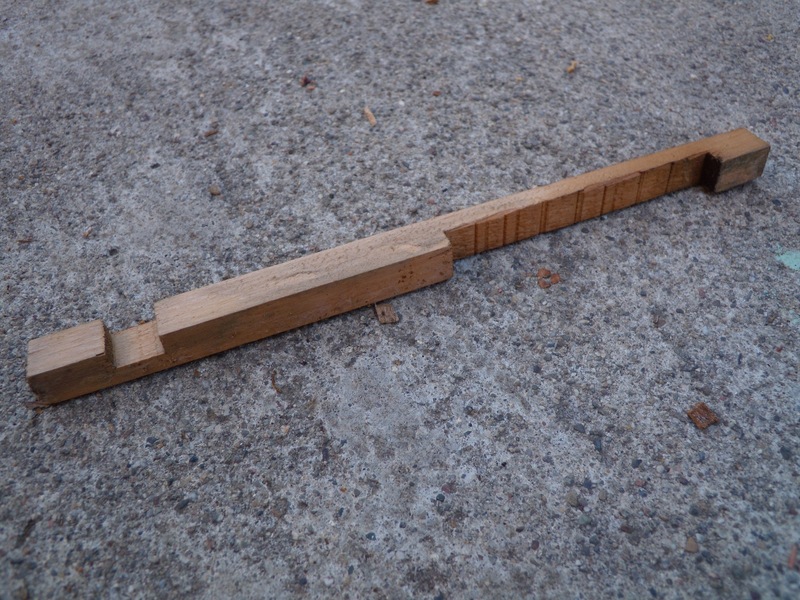 We have used craft sticks (big popsicle sticks) glued into the groove at the top of a regular frame where the foundation would normally sit. Craft sticks serving as a guide for the bees to draw their own comb in a foundation-less frame. 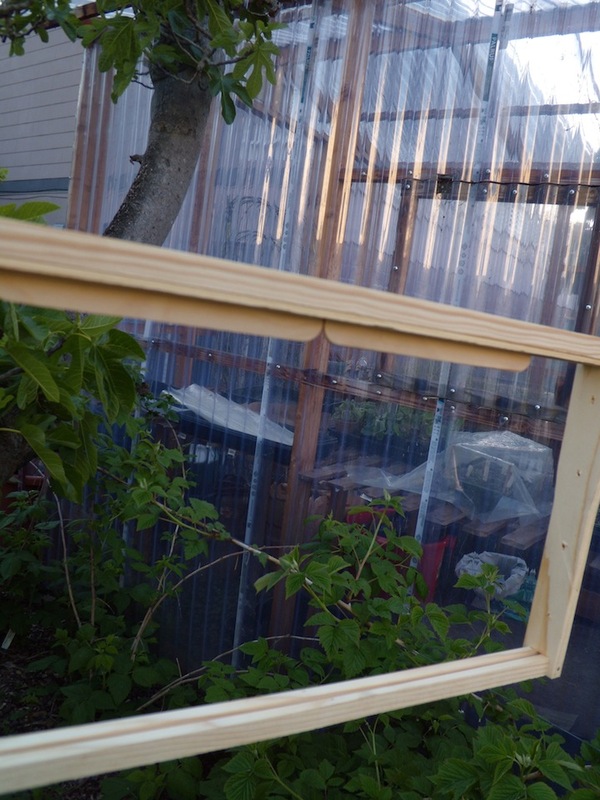 Frames are used in Langstroth hives to guide the bees’ building of comb. You can think of each frame as a wax comb that can be easily removed. Bees tend to organize their home such that some frames are predominantly used to store excess honey, while others are used for rearing young (and storing enough nectar and pollen to feed the young bees during development). 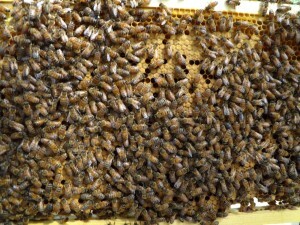 A frame almost entirely full of capped brood. 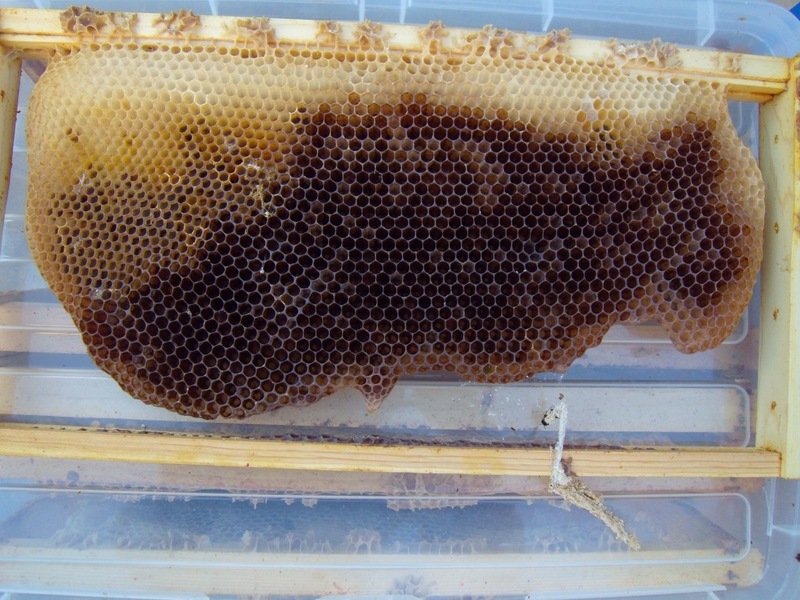 The bees drew nice straight comb on this foundation-less frame (though it now shows signs of wax moth damage). 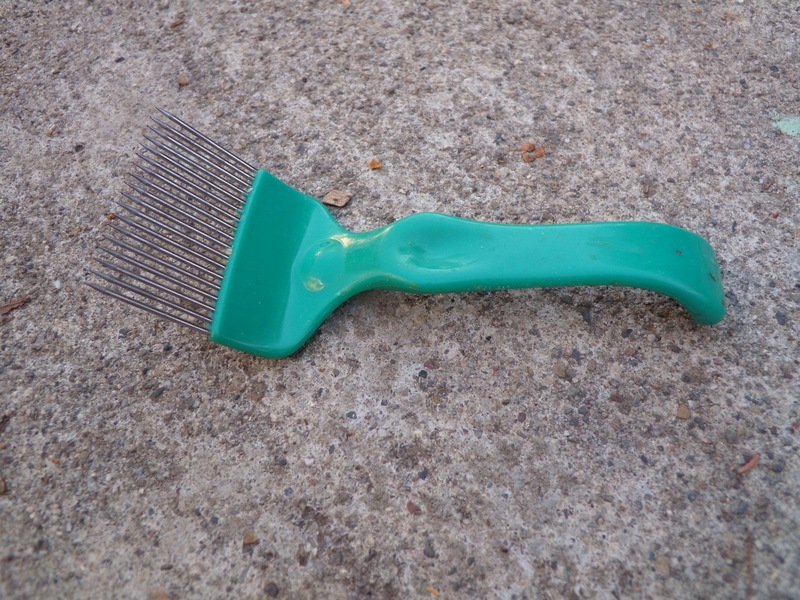 The color of the comb gives clues as to what has been stored there. 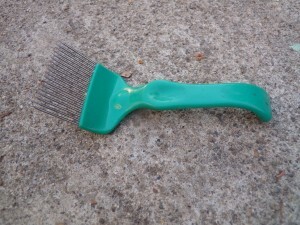 Dark comb, means brood was raised here. 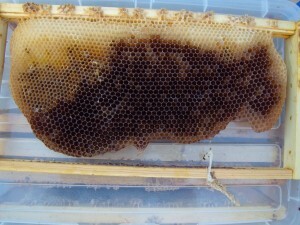 The light comb was used for honey storage. 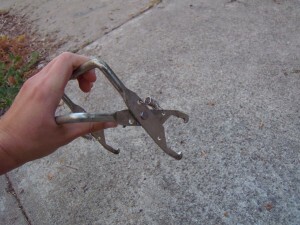 Frame grips are very handy for solo beekeepers. They allow you to easily pick up a frame (covered in bees and full of brood!) with one hand. 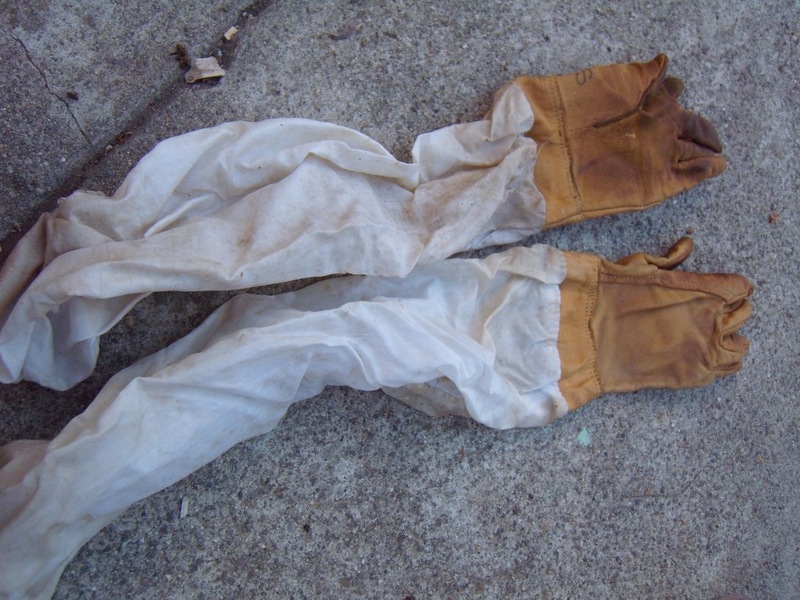 Thick leather gloves that pull up past your elbows can help protect from beestings. On the other hand, many beekeepers go without because gloves limit your dexterity and sensitivity when working a hive. 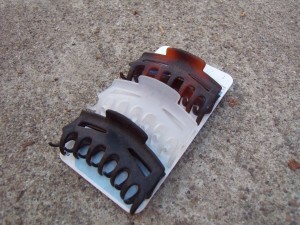 Hair claws (plus zip ties) can prove essential for reattaching comb to top-bars. Hive tools have many uses, including prying apart stuck boxes and frames, lifting one side of a frame out of the hive for easier grabbing, and moving frames back and forth within a box during hive inspections. Of course, hive tools come in all varieties, but here are two fairly common ones. This one is particularly handy for lifting the corner of a frame up enough to grab. 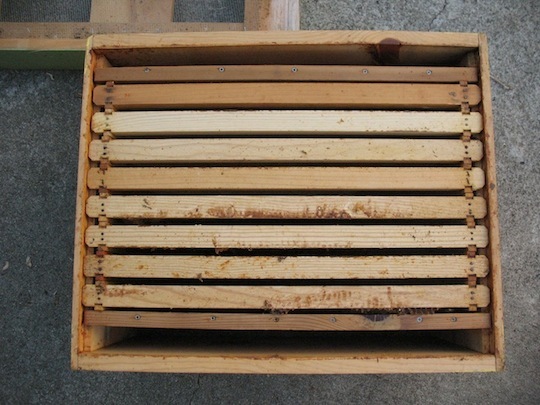 The inner cover of a Langstroth hive sits just below the telescoping cover. 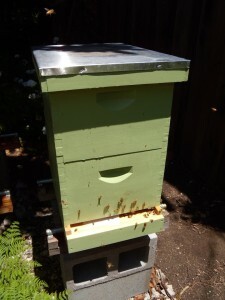 Because the telescoping cover hangs down on all sides, it would be very difficult to pry it loose if the bees used propolis to attach it to the top box. Enter, the inner cover. Though the bees will propolize the inner cover to the top box, it is easy enough to pry it loose with a hive tool. If you use migratory covers, you should not need an inner cover, since the migratory cover can easily be pried loose along the sides where it does not hang down. Inner covers also come in handy if you are feeding bees using the mason jar method. See pictures below. Inner cover on top before the telescoping outer cover has been added. This inner cover has a pheromone lure stapled to it for a spring bait hive. 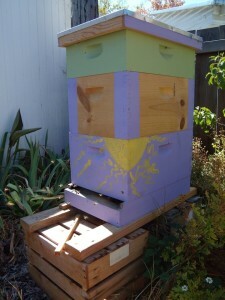 We are inviting a swarm to choose this as its home (less work for the beekeeper!). A top view of an inner cover with a feeding jar positioned over the opening. 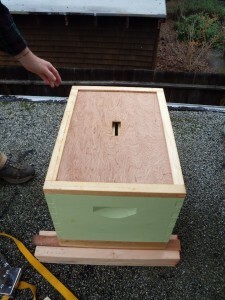 By adding another box on top of the inner cover, we make sure that only this hive’s bees go after the sugar syrup. From the outside, you can tell these bees are being fed because the inner cover is visible as a thin strip of wood between the two boxes. Langstroth hives are oriented vertically, with stacking boxes. Each box is filled with frames on which the bees draw wax comb. A standard box fits between eight and ten frames. Langstorth hives are favored by many beekeepers because they are relatively easy to move (professional beekeepers strap them on the backs of semis and truck them cross-country) and to manipulate. 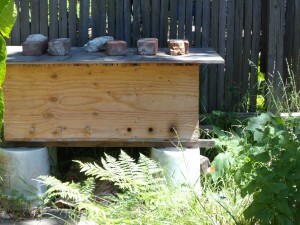 A professional beekeeper’s Langstroth hives, sitting on pallets for easy transport. 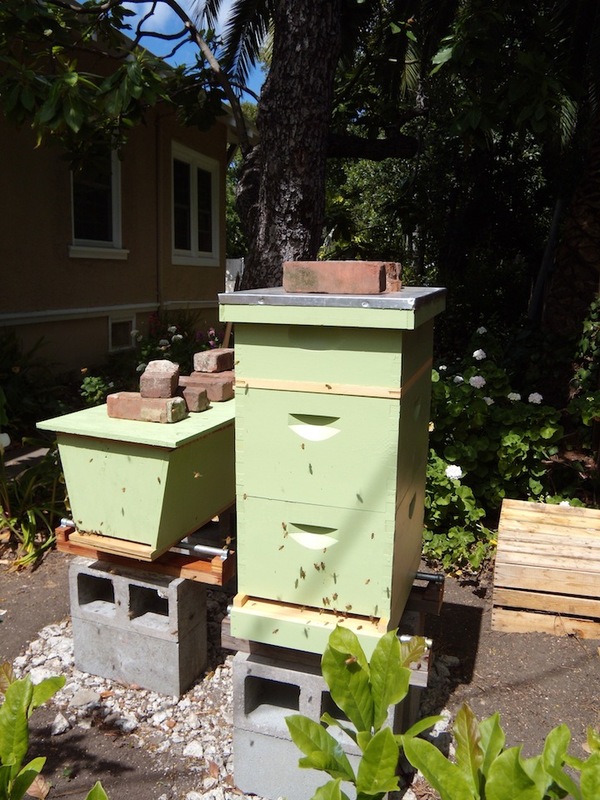 A top-bar and Langstroth hive side by side. Migratory covers hang over the front and back of the top box, but are flush at the sides. 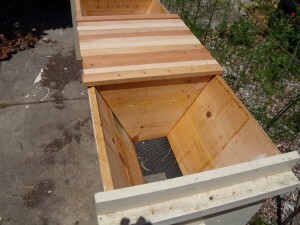 This allows hives side by side to be pushed flush together, making it easier to transport them and allowing for better insulation and heat retention in cold winter climates. They are more prone to warping over time than are telescoping covers. Still, migratory covers are favored by many large-scale professional beekeepers and by some hobbyists. These hives, sitting on pallets and ready for their next move by forklift, have migratory covers. 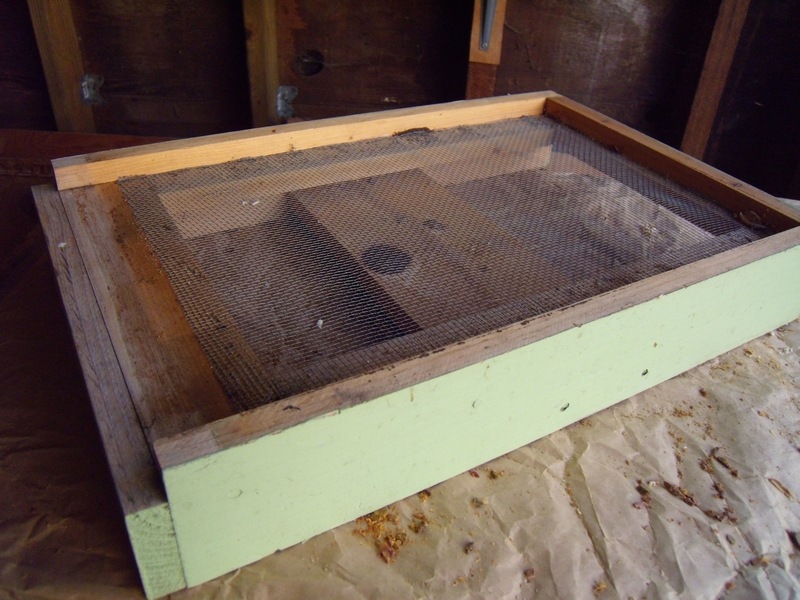 Screened bottom boards sit below the bottom box in a Langstroth hive and serve as the floor. The screen allows debris and pests to fall through, rather than remaining trapped in the hive. Beekeepers who conduct varroa mite counts can insert a sticky paper below the screen to catch falling mites. 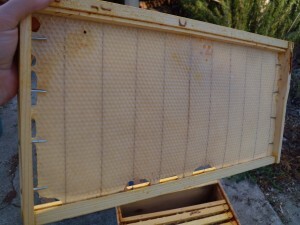 Some beekeepers leave the removable tray in most of the time, taking it out only to discard debris or to ‘read’ the activity in the hive (i.e. look at where bees are drawing comb, note whether they are bringing in pollen, look for the presence of drone brood hatching). 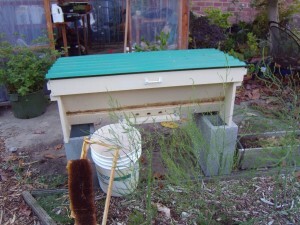 Others leave the tray out most of the time to allow for increased hive ventilation. From the back you can see the slot where the removable tray slides in. 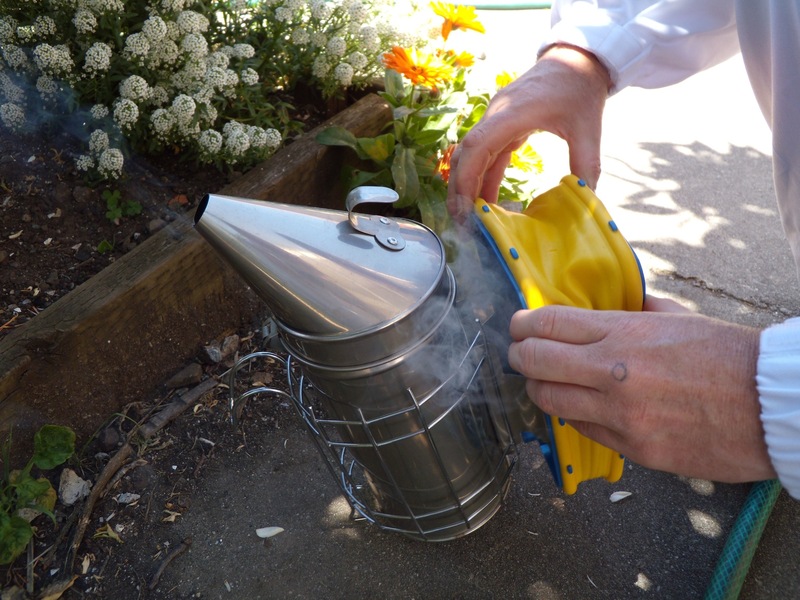 Using a smoker at the beginning of a hive inspection can help limit the bees’ ability to communicate via pheromones and can make for calmer bees during human hive intrusions. It’s important to get the smoker lit well before beginning an inspection, as in our experience they are prone to going out. Pack the fuel in tightly and work the ‘bellows’ after lighting until the flames die back to embers and there is a strong stream of smoke emitting from the smoker. Supers are less deep than ‘deeps’ (see above). When beekeepers have their way, bees fill supers exclusively with honey. This makes it much easier and more straightforward to extract said honey. The shallower boxes mean that the beekeeper is less apt to break her back when lifting the honey-filled super (honey is heavy!!!). 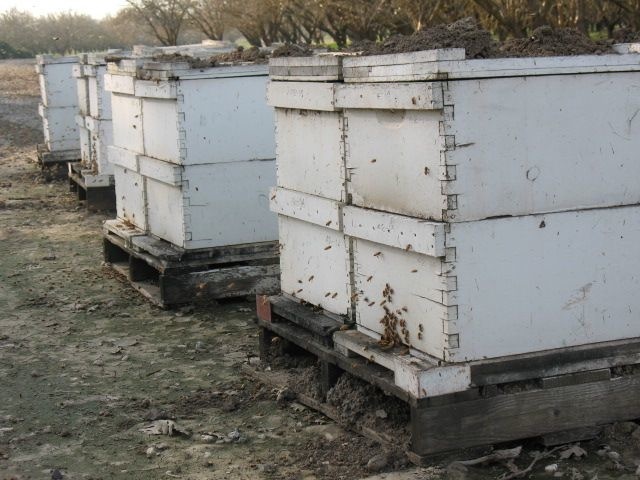 Some beekeepers (like ourselves these days) don’t use supers at all. An advantage to using all boxes of the same size (i.e. mediums or deeps) is that you can move frames around between boxes however you need to. If you harvest honey by the frame-full, rather than by the box-full, going super-less won’t break your back! Telescoping covers hang down on all sides of the top box (as the lid of a shoebox does). They are heavier and more expensive than migratory covers (favored by many commercial beekeepers). 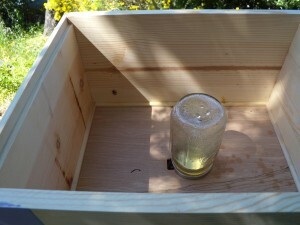 However, bees won’t propolize the lid to the box below it (i.e. they won’t stick the lid to the box with propolis). Telescoping covers also generally last longer than migratory covers, which may not hold up as well over multiple wet seasons. This Langstroth hive sports a telescoping cover with a metal top for added protection from the elements. 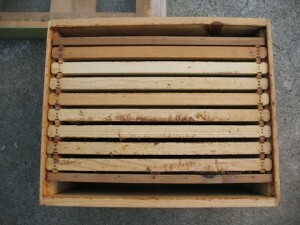 Top-bars are the equivalent of frames in a top-bar hive. 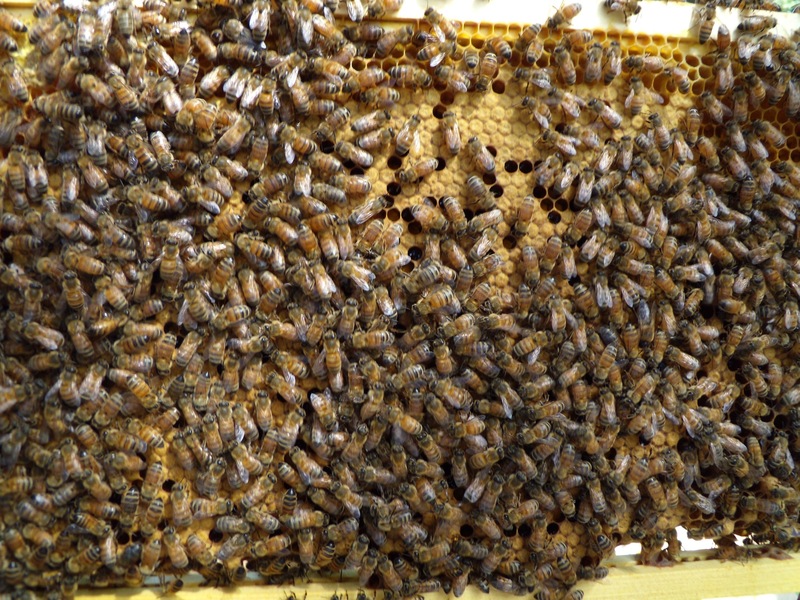 Bees draw combs that hang down from each top-bar. Generally, top-bars have some type of guide (i.e. 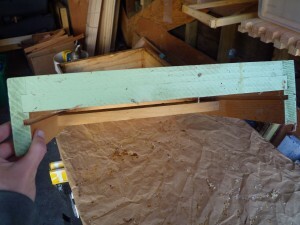 a protruding strip or ridge of wood) that lets the bees know where to start. This guide is an attempt to avoid cross-comb, or ‘crazy comb,’ that makes it challenging for the beekeeper to manipulate the hive and remove bars. The strip hangs straight down into the hive, and the bees use gravity to guide their comb building. Top-bar hives are oriented horizontally, as opposed to vertically oriented Langstroth hives. 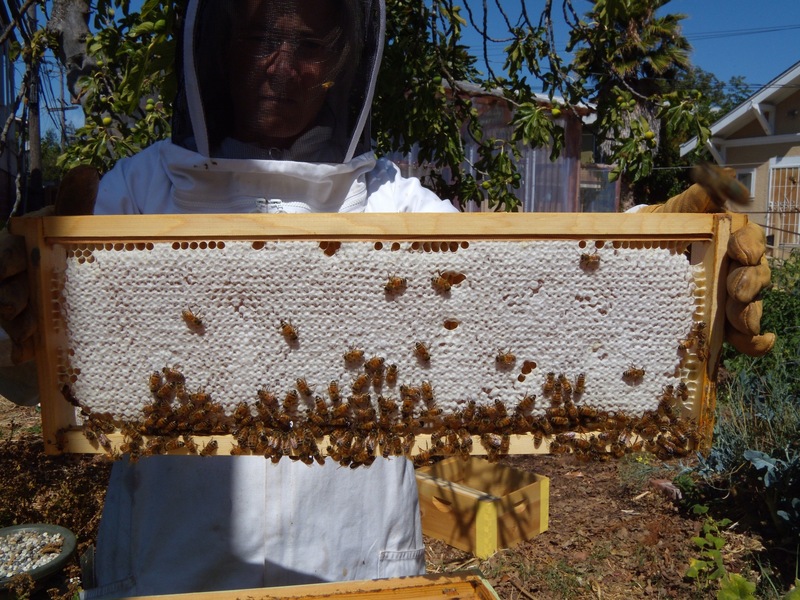 Top-bar hives are touted by some as more ‘natural,’ since bees in top-bars draw all their own comb. Top-bar hives are also said to be less costly to build than purchasing the equipment required for Langstroth hives. 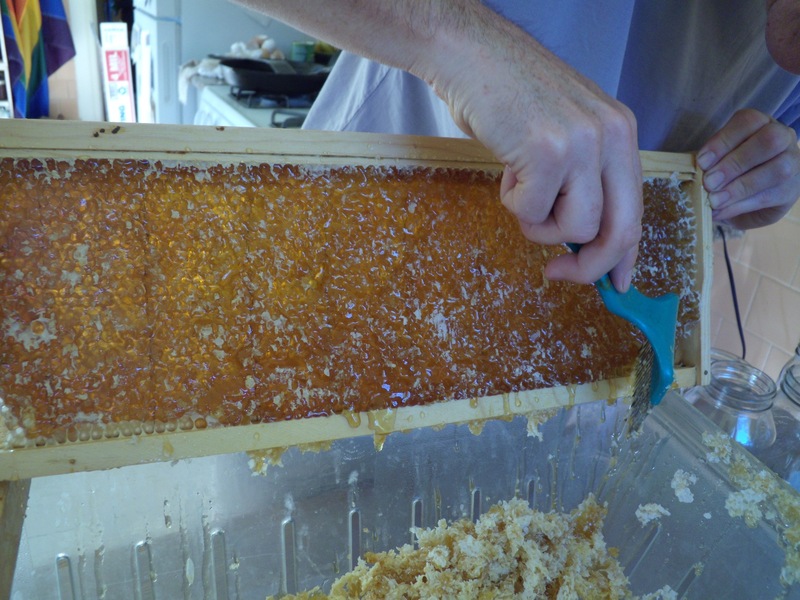 In order to harvest honey from top-bar hives, the beekeeper must remove and crush whole combs. 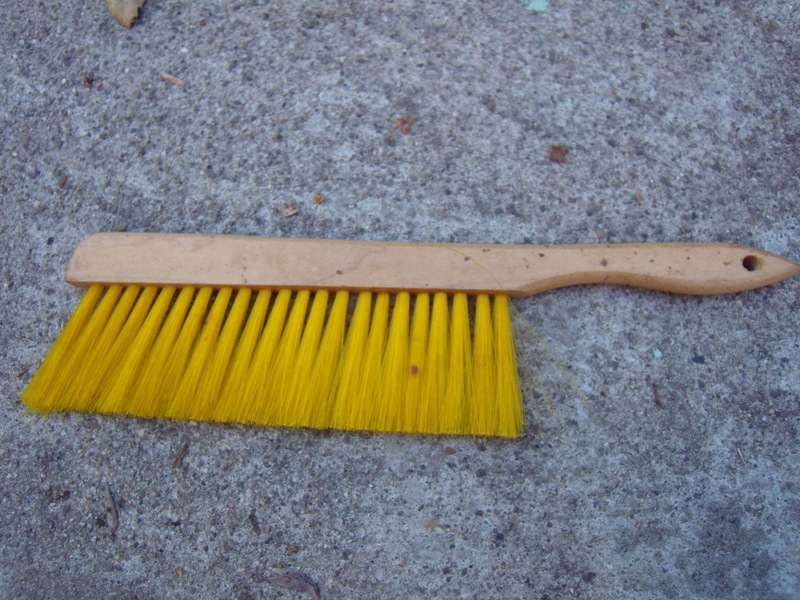 Thus, the comb can’t be reused, and bees in top-bars have more work to do drawing wax. Most people report harvesting less honey per year from top-bar hives, than from Langstroth hives. 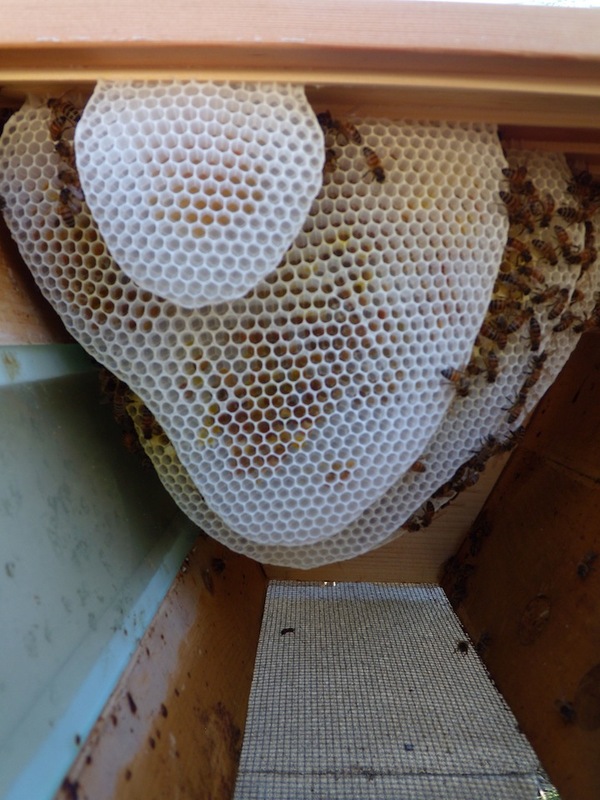 With the lid removed, you can see the bars centered inside the hive. There are divider boards sandwiching the top-bars. This method is used to modify the size of the hive, depending on the colony’s population. 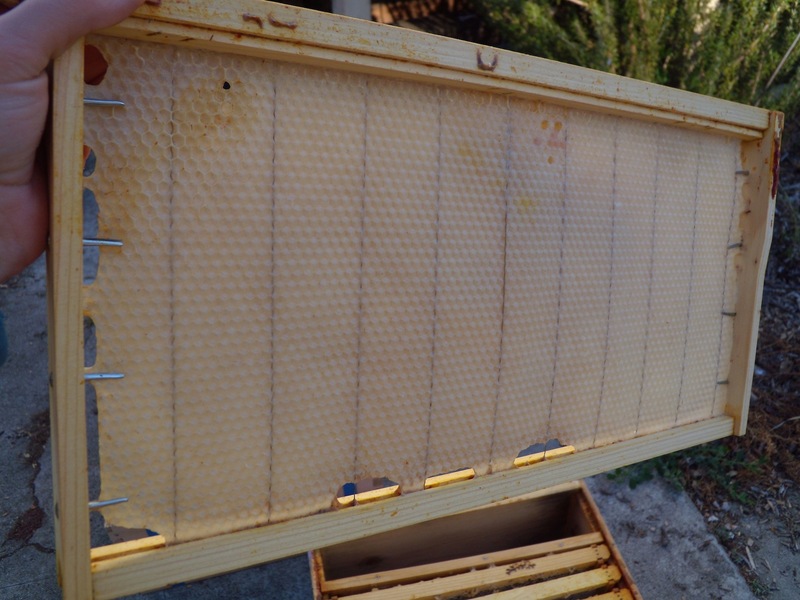 Inside this same top-bar hive, the bees have drawn comb from several of the bars. 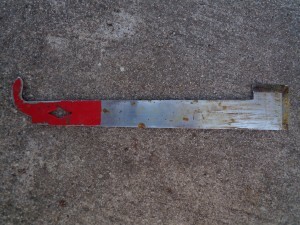 You can see the older, larger combs peeking out from behind. 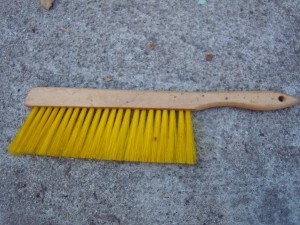 The comb in the foreground is not yet fully drawn. Different top-bar hives have different shapes and sizes. This homemade top-bar houses our longest lived colony. We threw together the box and bars without ‘plans’ over the course of an afternoon, but three years later the bees still seem to approve. 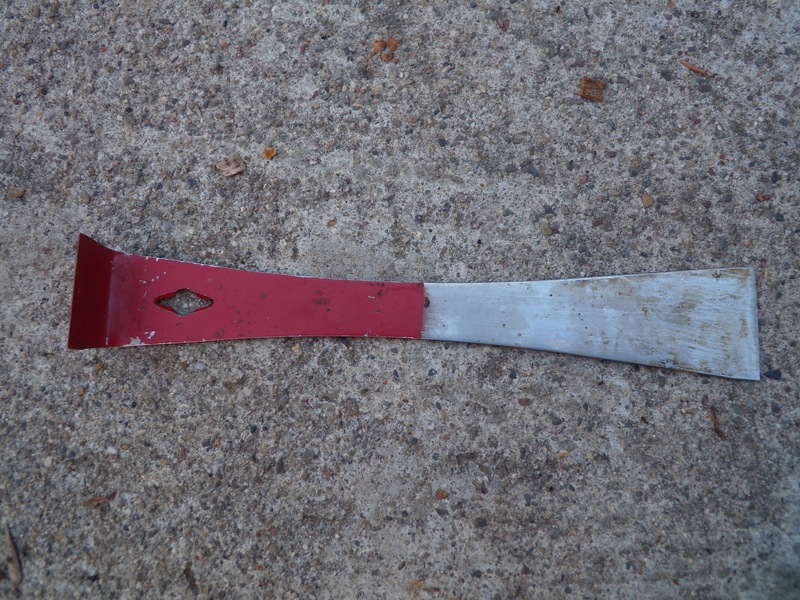 Uncapping forks are used to remove the wax cappings from honey comb before extracting frames of honey. They serve the same purpose as uncapping knives. 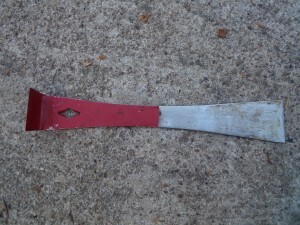 The uncapping fork in action.